If you spend a lot of time in the kitchen, cooking becomes intuitive. You add a little of this, a lot of that, tasting along the way just to double check that you’re not destined for complete and utter culinary fail. Most times this strategy works quite well. In fact, it’s almost better than following a recipe; if you start out without strict guidelines and a firm end goal, you’re never disappointed by the results, because you didn’t know what the results were going to be in the first place. This is how I cook. In fact, it’s why I cook; I like surprises. While some things require following recipes (baking for example), most of the time I am completely and utterly winging it. But, as it turns out, when I wing it and go with my intuition, I subconsciously channel my inner food desires. Let me explain. This has been a long week with long work hours. Hello deadline. As such, I haven’t had much time in the kitchen. At the end of the day, all I really wanted was to bike down the street and get a few Por Que No tacos. But, having left Portland for Paris, a bike to Por Que No would require a trans-Atlantic airplane ticket and a $150 bike box baggage fee. So, as soon as the thought of tacos arose, I quickly pushed it to the back of my mind. Not that tacos can’t be found in Paris, but not in my neighborhood. I also hadn’t been grocery shopping. Again, results of being on a deadline. Dinner would have to be some creative feat if I was going to eat anything interesting. Fortunately because of a socca obsession I always keep chickpea flour on hand. Always. And there were carrots and beets from the CSA, beautifully covered in dirt. A meal could be made. A few crepes and shredded carrots and beets later I realized that I had completely unintentionally made a version of tacos. 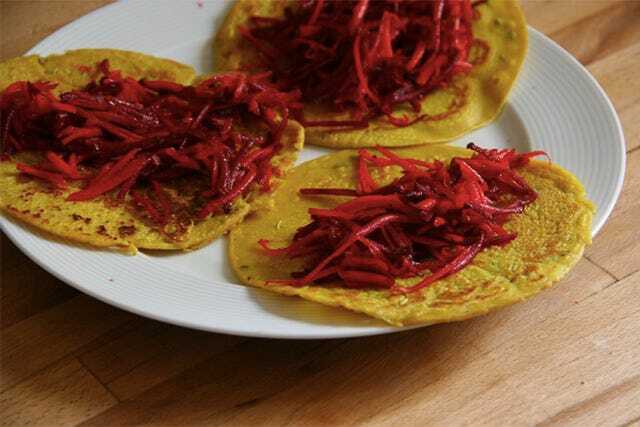 I know, I know, a thick chickpea crepe is no tortilla, and lime juice and olive oil certainly is no pico de gallo, but the colors were beautiful and the concoction so easy and simple, even by my own standards, that I surprised myself. These chickpea crepes are just a little thicker than regular socca, which makes them a good base for adding other ingredients. I can easily see these spread with hummus or goat cheese. Crepe tacos? Why the hell not. Start with the chickpea crepe batter. In a mixing bowl combine chickpea flour with water and oil. Whisk until you get a smooth, liquidy batter, being sure to break up any clumps of chickpea flour. Add in the turmeric, fennel seeds, salt, and pepper. Cover with a tea towel and place in the refrigerator for half an hour or so. After the crepe batter has set long enough, heat a frying pan with a little olive oil. Ideally you want to use a thick one — I use a small, steel Du Buyer which does wonders. When the pan is hot, pour in 1/4 cup of the batter. 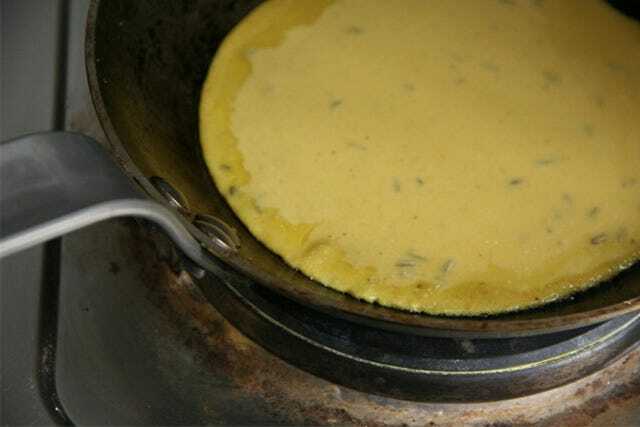 To get the perfect crepe/tortilla looking shape it’s easiest to use a small pan. Fry until the center of the crepe is solid, about one to two minutes, and then flip over and fry the other side. 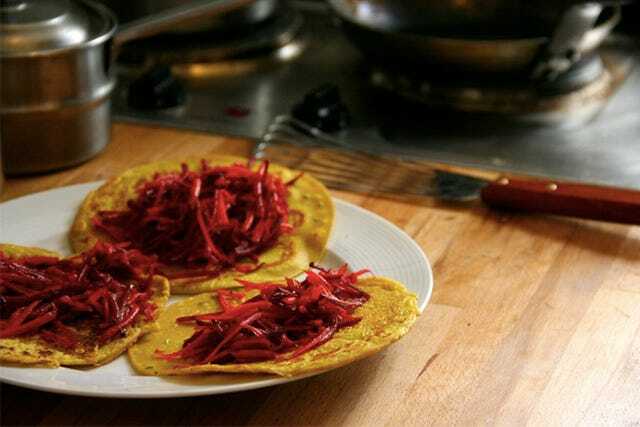 Place the crepe on a plate and put a bit of beet and carrot salad in the center. Serve and enjoy. If you don’t want to make all the batter in one batch, just store it in the refrigerator. It’s good the next day as well.